The Pleats of Matter (2005-2007), which takes its title from the first chapter of Deleuze’s The Fold (an investigation of the Baroque, Leibniz, and the monad), is a work that explores the nature of folds, bends, and pleats, and their concomitant implications of surplus, enveloping, collapsing, and obfuscation. It is a work in which overflowing trajectories of material and process collide, overlap, collapse, and slide, where strata melt and rupture and deform, and where form and shape are only the final byproduct of lines folding into one another, of shapes subsumed by other shapes, of forms twisted within other forms. The guitar itself, or at least the physical, sound-producing manipulation of the instrument, is a folding: the interaction between finger and string and fret, the bending and wrapping of strings with the nut and bridge and tuning pegs, the folding and slackening from the tremolo bar …. In this work, these folds are all made independent, not so much layered as merely simultaneous. The two hands traverse the fretboard independently, freed from their conventional roles and geographies. Either hand might at any moment be plucking, strumming, depressing a string, scraping, sliding, or bending, and moreover, these actions are as likely to appear behind or above an already-depressed fret as below. Joining this interface between finger and fret and string are the actions of the tremolo bar, itself bent and folded by both hands and the occasional elbow, two footpedals that bend and shape and twist pitch and timbre, and a further array of amplification and processing modifications on two additional electronic strands. The electric guitar, perhaps more than any other instrument, involves a massive chasm between the physical process of sound production and the actual sounding result. The instrument includes the ability to separate thoroughly the physical from the aural, with sound distorted and refracted and disembodied through any number of layers of electronic manipulation. This work aims first to push the lacunae of this separation to their limits, and second to envelop and embrace these gaps as being part of the essential and fundamental character of the instrument. An extensive and wildly indeterminate scordatura is employed (the work is written in an extended tablature notation throughout), and, while the (physical) motions of the various effects pedals and amplification levels and patch changes are notated in detail, the actual sonic character of the effects patches themselves are left open and unspecified. Thus, while the physical component of the work is entirely repeatable and vaguely predictable, the sonic and timbral component is open to dramatic and indeterminate variation from performance to performance and from performer to performer. 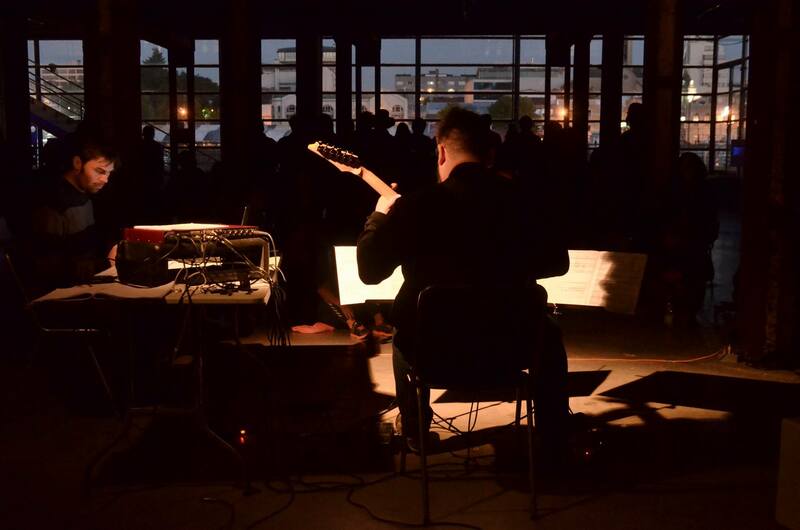 The title of the work, too, is a deferential and not particularly veiled reference to Richard Barrett’s Dark Matter, or, more specifically, to transmission, the work for electric guitar and live electronics that forms the crucial central thread of the larger work. It was impossible, in writing an electric guitar piece for Daryl Buckley, to avoid acknowledging the influence that Richard’s music and ideas (not least in Dark Matter, a work for which I hold unmitigated enthusiasm) have had on my work over the last decade. transmission casts a particularly long shadow, and, to mix metaphors, raises the bar for the instrument’s repertoire very high indeed. The challenge of writing in that shadow has been frightening and exhilarating. The work is dedicated in friendship and thanks to Daryl Buckley. “Determinate Action/Indeterminate Sound: Tablature and chance in several recent works.” Facets of the Second Modernity. New Music and Aesthetics in the 21st Century, Volume 6. Mahnkopf, Schurig and Cox, eds. Wolke Verlag, June 2008. 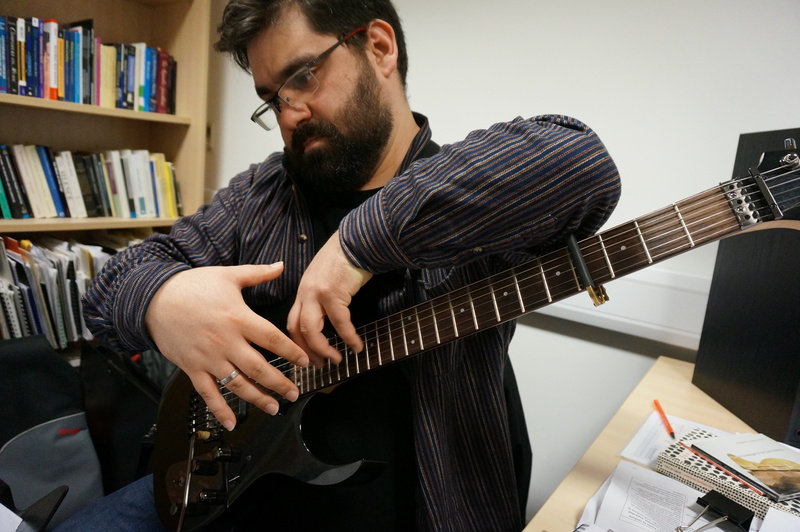 Diego Castro Magas, body, mimesis and image : a gesture based approach to interpretation in contemporary guitar performing practice. Doctoral thesis, University of Huddersfield, 2016. Diego Castro, electric guitar. Alba New Music, Edinburgh, Scotland, October 7, 2016. Diego Castro, electric guitar. Orpheus Institute, Ghent, Belgium, November 11, 2015. Diego Castro, electric guitar. Electric Spring Festival, Huddersfield, UK, February 20, 2015.